"the latest high tech Apo design series - in a compact, traveling configuration"
Made for those who demand premium Apo performance and manageability yet with enough light-gathering power to make deep sky observing interesting too. Astro-Physics has designated this 130mm f6.3 StarFire EDF as the "Gran Turismo" model to highlight its potential to travel to the four corners of the Earth. This continues the Astro-Physics tradition of excellence, and in this case "Made In The USA" means the best there is! Announced on 28 April and we began to accept orders in June 2008, the 130mm f6.3 Starfire EDF is the sequel to the proven 160mm Starfire EDF, and 140mm Starfire EDF telescopes. This series introduces the most recent high tech Apo designs incorporating triplet apochromat lens arrangement. This is the culmination of years of optical research by Roland Christen, President and optics designer of the Astro-Physics Co. It is made with the best available grades of optical glass to achieve exceptional image brightness and excellent color correction. And it incorporates the latest in high efficiency multi-coating technology to improve light throughput through the oil-spaced triplet lens. Right: Astro-Physics 130 f6.3 EDF telescope installed on optional Mach1 GTO German Equatorial Mount (44,257 bytes). Roland designed this telescope with approximately the same focal length as the original and highly successful 130mm f6 EDF Starfire (produced from January 1995 through December 2003) so that the 130mm can be used with all of the same specialized film astrophotography and CCD imaging accessories that were originally designed for these earlier telescopes. Company Seven retains 130mm EDF SN 001, the first production model, on display in our showroom. Visual astronomers will enjoy the Gran Turismo's wide range of uses possible due to it's compact 820 mm focal length. This design effort also produced mechanical refinements of the Optical Tube Assembly and Focuser. The 130mm EDF is provided with a rotating Astro-Physics 2.7 inch Focuser (P/N 130EDF27) and this includes a dual speed geared Feather Touch® Micro Focuser as standard equipment. Furthermore, the Gran Turismo is the first Astro-Physics telescope that has been engineered to be taken apart into three sections so that it may be packaged in a form compact enough to permit it to be carried onto most commercial aircraft. We are certain that astro-imagers as well as visual observers will find this scope a real joy to use. Deliveries of the first version of this design (the 160mm Starfire EDF) began in December 2004. 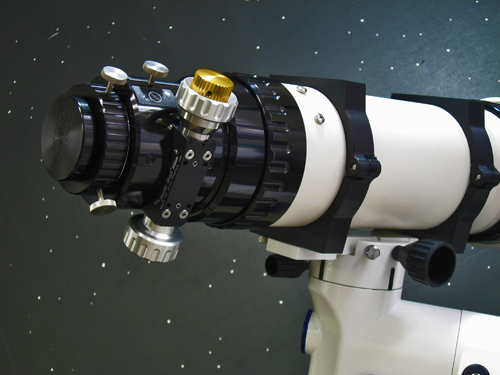 The first of our 160mm EDF instruments arrived in August 2005 and was placed on display in Company Seven's showroom collection for those who wish to see it alongside many of the other popular Astro-Physics telescopes. This instrument has been independently tested using consistent methods against older and current production instruments, and even against the 155mm EDF it has tested as superior even if the differences are imperceptible in practice. The EDF series telescopes are each superb as a visual or imaging instrument. The 130mm EDF is easily capable of high-power observations of the moon and planets, and it has enough light gathering to be very rewarding for deep sky visual work as well as outstanding for imaging. The color correction is ideal for visual uses being completely free of false color; secondary spectrum is totally absent at any power and this allows the observer to discriminate the subtle color variations on the surface of the planets. 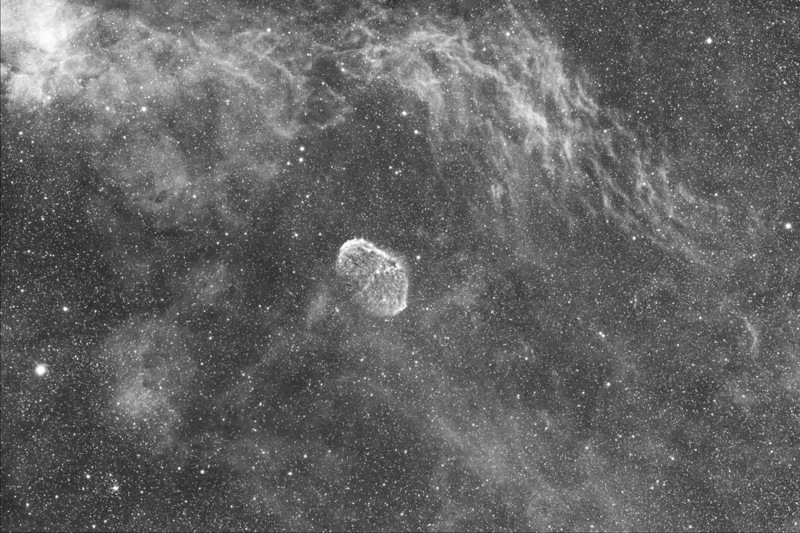 Deep-sky views are equally impressive due to the broad range of possible fields of view (from low magnification to high), and very high transmission of the three glass types and advanced multi-coatings. At prime focus one can scan the sky or view a panorama seeing 3.2 degrees of area at 15X, or with the optional Visual Telecompressor at f/4.7 one can enjoy fields of view of up to 4.3 degrees! Performance will rival much larger obstructed systems because the contrast is excellent; stars snap to focus, individual stars are sharply etched as intense diamonds against a black velvet background - a beautiful sight! These objectives are APOCHROMATIC which means that the images are essentially free of false color both visually and photographically. Roland Christen selected Super ED glass to be the heart of his new optical designs because of its excellent light transmission and superior correction of all the monochromatic and polychromatic aberrations. Super ED is a more advanced glass than the more common varieties used in commercial refractors. It has allowed Astro-Physics to use crown rather than flint for the outer elements. Normal ED (FK01) and even Fluorite doublets use flint glasses as the leading element, causing the color correction to be less than perfect, especially in the violet region of the spectrum. These flints introduce false color that can be seen as purple halos around bright objects, or purple fringing along the Lunar edge and at the edges of bright craters. This color error can cause brighter stars to bloat on long exposure photographs. Cli The objective lens is made with Super ED glass (ED stands for extra low dispersion, glass with a Vd < 90) that provides color free performance even at this fast focal ratio. The specifications set by Astro-Physics for the raw glass demand high purity (homogeneity) and freedom from striae to the highest tolerances that can be manufactured. The objective lens consists of a positive element of Super ED glass surrounded by two matching hard crown meniscus lenses. The two outer elements are chosen so that the combination is free of coma, spherical aberration and other higher-order aberrations. Under steady viewing conditions, you will see a hard white Airy disc at focus surrounded by the first diffraction ring. Inside and outside of focus, you will see an evenly illuminated, expanded disc with concentric Fresnel rings, the outermost ring brighter and wider than the rest. 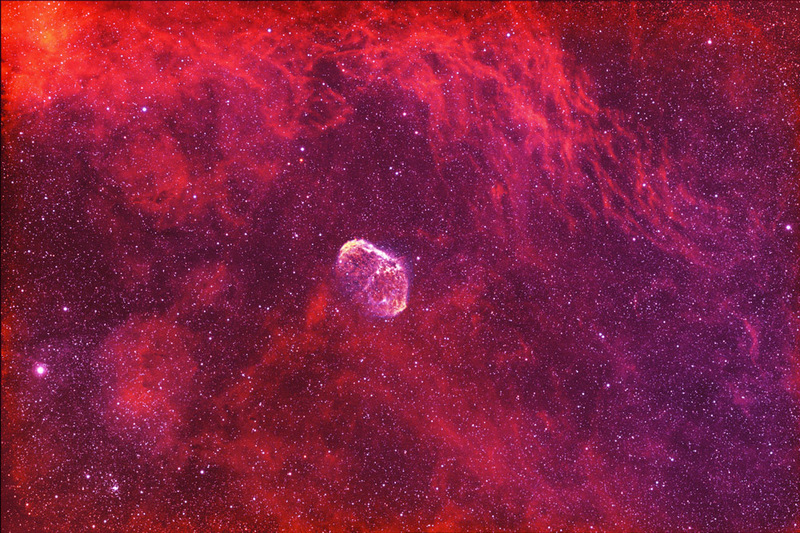 Images of stars and planets are presented as intense diamonds in their natural colors against a black velour night sky, while daytime objects appear sharp and contrasting without annoying false color (crimson or purple fringes). The 130mm EDF f/6.3 lens design not only appears great on a computer design program, it actually works well at night too. This lens arrangement is engineered with decades of experience for rapid cool down during night time temperature swings, so this telescope is practical for use in temperate as well as very cold climates. On most chilly nights the settling down time for the lens is between ten to fifteen minutes, while in subfreezing conditions it rarely takes more than thirty minutes to stabilize. State of the art lens coatings technologies are applied to the objective lens elements, and computer aided engineered internal baffling of the tube assembly facilitate the transmission of light through and between the objective lenses and to the focuser in a manner optimized to produce superb contrast and color fidelity. Looking down the barrel of one of these optical tubes reveals something resembling the blackness of Space with no reflections or opportunities for glare or ghost images to form. The multilayer coating is applied to the lens surfaces to prevent light reflection off the surface of, or between the lenses. This helps to eliminate the possibility of ghost images or flare, and this improves color rendition too achieving a dramatic increase in image contrast. The coatings provided are a recently developed multilayer antireflection coating; this provides a cumulative light transmission greater than 97% acacrossross the peak visual wavelengths and improved durability over prior choices. Right: Antireflection coatings and baffling render the lens and tube interior virtually invisible on this Astro-Physics 130mm f/6.3 EDF telescope, even with its Lens Shade retracted (70,442 bytes). Click on image to see enlarged view (204,340 bytes). The improvement of the new coatings over those provided with previous EDF models is apparent even to the trained naked eye. With the increase in light throughput and reduction of possible ghosting due to the new multi-coatings, Astro-Physics can continue to produce a superbly corrected lens. The 2.7 inch focuser means those who seek the most manageable version of a high performance Apo can save money and weight. 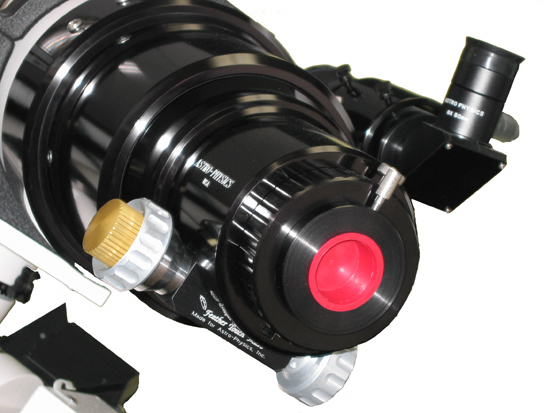 The 2.7 inch focuser can accommodate CCD or film cameras with up to 43mm diagonal formats. 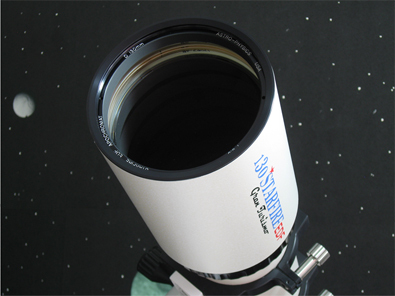 This refractor can be used photographically with a 35mm Single Lens Reflex (SLR) digital or film camera at prime focus with only a simple camera adapter however, best results will be obtained if the telescope is equipped with the optional Field Flattener Lens that will permit coverage of 3 degrees across the diagonal of the format. Or cover even wider areas approaching 4 degrees at f/4.7 with the optional matched 0.75x flat-field telecompressor. As CCD camera technology has advanced the quantum efficiency has improved. These devices are now can have good sensitivity beyond the visual into the UV (< 400 nm) and the IR (> 700 nm) portions of the spectrum. working at F5.7 with the 155TCC Telecompressor Corrector, SBIG STL11000 CCD camera. 2 x 20 minutes H-alpha and 2 x 20 minute O3. Red = Hå, green = 1/2(Hå + O3), blue = O3 . With 10nm Hå filter, 4 hours exposure. 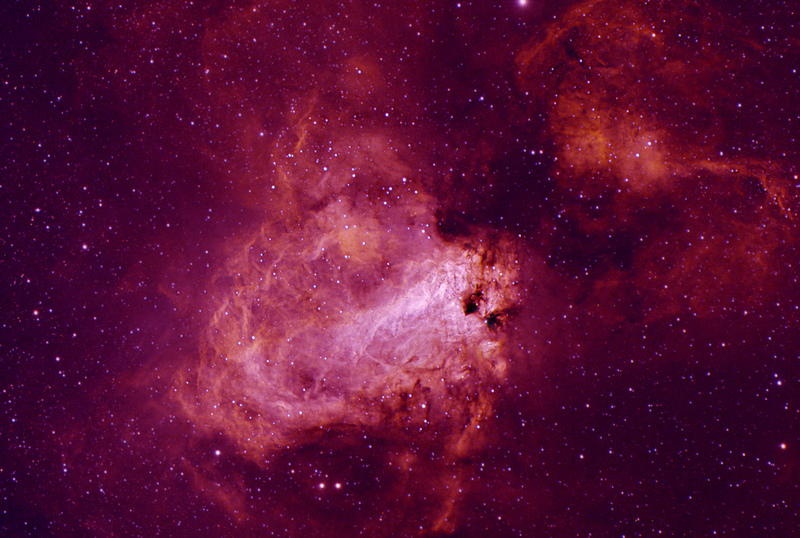 See cropped close-up NGC 6888 color image. Many will wonder how this telescope compares to the prior generation of the AP Apos which were announced at Company Seven on 1 December 1989 and then came to dominate the market from then until now. The current 130mm EDF will produce an image that will appear the same to the eye as its predecessor even though it differs slightly in focal lenth. Astro-Physics chose to make this new EDF with 820 mm focal length compared to the 770 mm that was typical of the prior 130mm f6 Starfire EDF, so physically the optical tube is longer by two inches. But since the assembled 130 EDF telescope does not comply with commercial airline carry-on luggage dimensional restrictions, it has now been made to disassemble for transport into three pieces. I have never had a problem taking my older AP 130 in its C7 made zip up paqdded bag (about 27 inches long) onto an airplane. 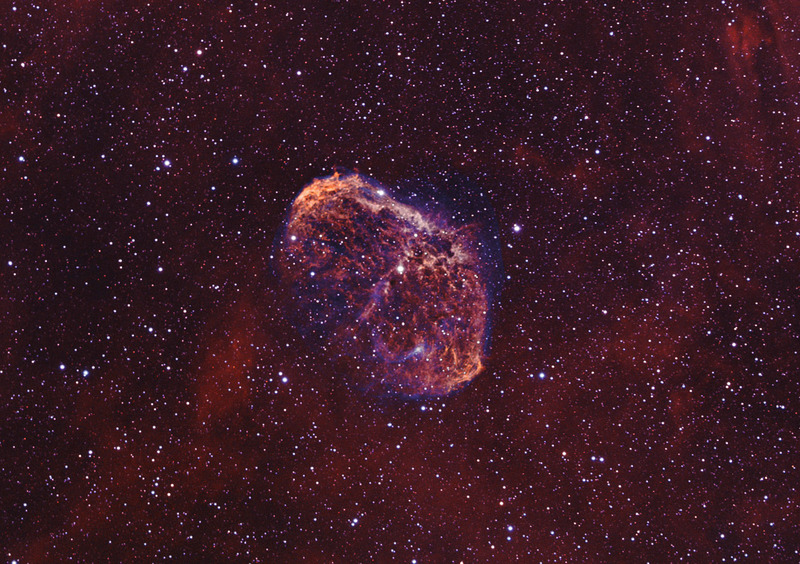 Right: Astro-Physics original 130mm f6 EDF Starfire (Serial No. 1!) at right installed on the Astro-Physics Model 400 QMD German Equatorial Mount on display next the new 130mm f6.3 EDF 'Gran Turismo' telescope on display at Company Seven's showroom (98,733 bytes). Click on image to see enlarged view (231,404 bytes). The airline carry on case dimensions limits tend to be on the order of 22 x 17.7 x 9.8 inches (56 x 45 x 25cm) including wheels, handles, etc. There is an exception for musical instruments and some medical gear, but unfortunately not for lenses. So you can carry a guitar onto the plane, but not a telescope unless it is less than 22 inches long in its bag or case. Note these regulations may be relaxed for First Class flyers, and are subject to change, so double check these before traveling. Dimensional restrictions can vary by airline, so if you fly one leg on an airline that permits your case on then another might not. Telescopes, cameras, and electronics are usually NOT insured by the airline's lost or damaged luggage policy. They are considered sensitive items that the airline will simply not take responsibility for. There are limits of liability for the airlines, usually something on the order of $500 per bag. This will not reimburse the cost of even one good eyepiece. Also dragging a telescope with a suitable stand and with it's associated gear through an airport and security check points can be a real burden. carried on, and kept near you at all times. The new EDF lenses have slightly better visual color correction over the spectral range from 400 to 700 nm than their predecessor. The previous EDF/EDT lens design had slightly worse visual correction over this range, but somewhat better color correction to 1000nm in the IR; this factor is not very relevant to most who are involved with CCD imaging since IR blocking elements or coatings are frequently employed in their imaging systems. In production the EDF oiled design objective requires all the external and internal surfaces must be polished fully, and then the lenses are carefully matched and corrected to one other which includes a time consuming apsherization process. The current EDF design still requires a highly perfected polish as with the prior design however, this EDF is more spherical and this makes it somewhat easier to finish than the prior generation of EDF. And in these EDF's the curves of the opposing elements differ. "All polishing including hand correction is always done on a machine. Steep curves are no worse to polish to high accuracy than shallow ones. In fact, very shallow curves are the most difficult to get right. For an apo triplet, every surface must be matched to a very high tolerance level to an interferometric test plate. Only if this is done will the spherical and color correction come out right. Apo doublets have slightly lower requirements, and achromats have much looser tolerance for color correction than a triplet lens." There are many ways to polish a glass surface, and the oft used words "machine polished" really means very little. There is no-one in this business that pushes glass around by hand. There is a vast difference between precision polishing and rapid polishing of a surface. Rapid polishing can clear a ground surface is 10 minutes or less. Some new processes can do it even faster - a few seconds for a 6" part. The surface will not be very good in either case, and will have machining marks and zones on a microscopic level. Precision polishing takes many hours with specially made pitch laps. That's the only way to get consistent high surface finish." As has been the case for more than a decade, these optical tubes remain the standard of excellence in mechanical design as well as in optics. The mechanical construction provides this telescope will be completely trouble-free, and the optics will remain permanently aligned unless it suffers some catastrophic injury. The gorgeous tube assembly is precision machined in the Astro-Physics shop with the most modem CNC equipment available; there are no fragile die castings in this telescope. Expert machinist transforms solid, aircraft-quality aluminum stock into a fully baffled tube assembly with no less than twelve knife-edge baffles in the focuser draw tube alone. Astro-Physics has has endeavored to achieve the highest absorption of stray light possible to give you the maximum contrast. The exterior textured finish of the optical tube and dew cap will retain its deep, lustrous beauty for many years. The texturing also reduces the chances of the optical tube sliding in the rings or in your hands (particularly when wet with dew for example) than the original gloss white finish provided with the early 1990's EDF models. You will appreciate the unique design and fine craftsmanship of this telescope - even on cloudy nights you might be content to stay home and just look it over. The objective lens resides in a cell that maintains its collimation even under conditions of vibration during shipping. The captive sliding dew cap (lens shade) features felt lining and an integral baffle placed at the leading edge to help prevent dew accumulation as well as to block stray light. The telescope is designed with the astrophotographer in mind and so it incorporates the Feather Touch dual-speed geared manual focus control. While the Focuser can be precisely rotated a full 360 degrees. These features allow more accurate focus, and the optimal composition of the image whether in the eyepiece or camera. Above: Astro-Physics rotating 2.7 inch Focuser on 130mm Gran Turismo telescope with optional protective 2 inch Particle Wave DDCAP desiccant holder. (each image Appx. 33.5 kbytes). Click on each image to see enlarged view (each Apprx. 136.3 kbytes). Helical rack and pinion arrangement provides smooth motion, free of backlash or wobble, for precision focusing. The 2.7 inch model provides an inside diameter (I.D.) of the focuser draw tube of 68mm (2.7 inches). This allows the visual astronomer to employ any eyepiece made, even our largest TeleVue "Über Eyepieces" such as the TeleVue 41mm Panoptic or the TeleVue 31mm Nagler. While one can also attach optional Astro-Physics field flattening or telecompressor lenses and hardware to accept a 35mm format film or CCD camera to pursue astrophotography images. The components are machined to extremely high tolerances, assuring that there is no rotational or lateral wiggle between the draw tube and housing. More than a dozen knife-edge baffles are machined into the wall of the draw tube and painted anti-reflection black in order to maximize contrast by essentially eliminating any internal reflections. Recessed brass locking rings are installed at each thumbscrew location. As you tighten each thumbscrew, the brass locking ring clamps onto the part that has been inserted. Consequently, your focuser draw tube and accessories are held securely in place. This is particularly important considering the heavy and expensive accessories that you may use. As an added advantage the brass will not mar the surface of your accessories. A knurled collar at the forward end of the focuser allows the user to loosen the focuser and rotate it smoothly on the optical tube throughout a full 360 degrees of travel to suit - all without the need of tools or loss of critical alignment. Advanced engineering eliminates the need to grease the focuser drawtube thereby eliminating a magnet for contaminants, and reducing "stickiness" when focusing which may have been encountered with other focusers on very cold nights. Focus travel is a generous as the 2.7 inch focuser drawtube extends to 111mm (4.4) inches. And the 2.7 inch focusers are positioned on the optical tube so that the optional Baader Planetarium/Carl Zeiss Mark V Großfeld Binocular Viewer will come to focus with or without it's provided 1.25x compensator. 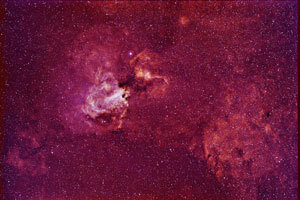 This allows the user to see glorious wide field views with both eyes - a real treat. In 2004 Astro-Physics developed a specially designed dual-speed pinion fine dual speed geared focuser assembly. Incorporating a 9 to 1 geared reduction knob, this is the Feather Touch® Micro Focuser. It is provided factory installed with the telescope. Incidentally, it is also available as an retrofit kit for existing compatible Astro-Physics 2.7 and 4 inch focusers. 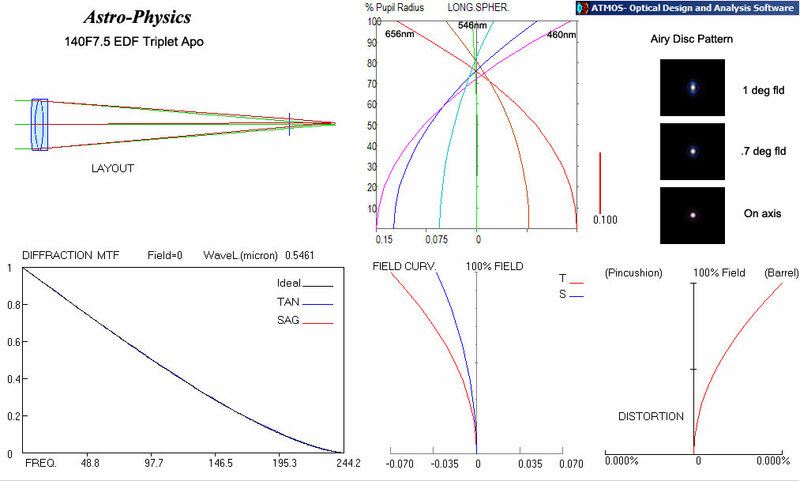 Right: Feather Touch® Focuser shown option on Astro-Physics 155 mm EDF Apo telescope 2.7 inch Focuser. Also provided with the 4 inch model (54,384 bytes). Click on image for higher quality, enlarged view (125,877 bytes). You can use the larger or standard slip accessories on this focuser since it is provided with reducers to accept optional 2.7 inch accessories, and another reducer to accept 2 inch accessories, and a reducer of from 2 to 1.25 inch. 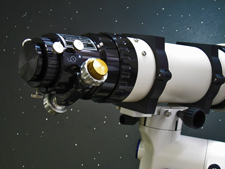 For those who wish to employ the telescope in a straight through arrangement we also provide an extension tube which attaches onto the focuser drawtube bayonet mount. 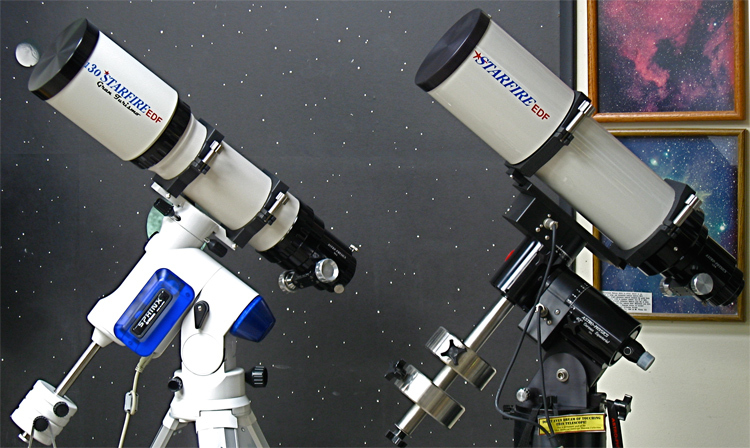 A suitable German Equatorial Mount and mount attachment hardware such as those developed by Astro-Physics. These portable mounts are perfect for visual and photographic studies in either the Northern or Southern Hemispheres. Another very capable astrographic German mount that is not costly as the Astro-Physics mounts and more readily available is the Losmandy G-11 German Equatorial Mount. For the 130mm EDF these will be the 4.7" Rings, sold by the pair as P/N 47RING. Prism diagonals may introduce aberrations which degrade perceived image quality. Since this is especially noticeable in telescopes with fast focal ratios, we recommend use of the Astro-Physics "Maxbright" Precision Mirror 2 Inch Diagonal. Low magnification: for views of the faint deep sky objects a 32mm to 41mm focal length eyepiece. 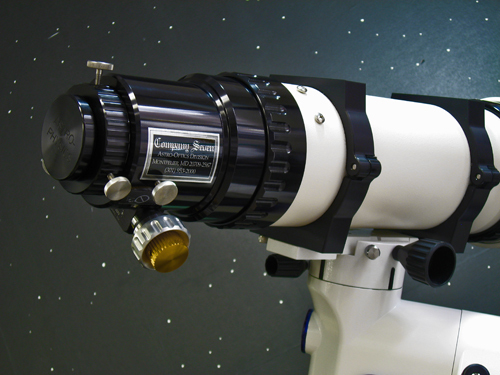 Astro-Physics and Company Seven recommend the eyepieces of advanced designs such as those pioneered by Al Nagler, founder of the TeleVue company. 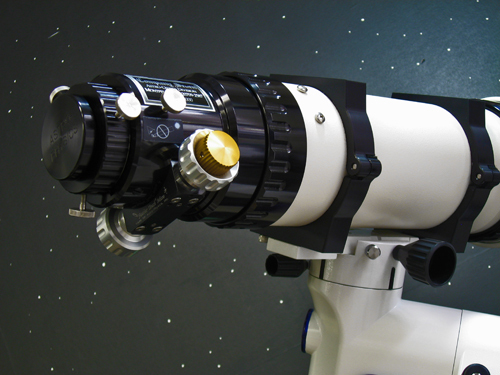 TeleVue's advanced designs include the "Nagler", "Radian", or "Panoptic" series eyepieces. These oculars will provide the widest angle clear, and flat field images bringing out the most in this (and many other) telescopes. And for those who seek the most detailed images of the planets or close double stars, you should also consider the Astro-Physics Super Planetary Eyepieces. You may slso consider using our Astro-Physics 2" (2X) Barlow to double your magnification, and increase overall versatility of your eyepiece selection. Field Flattener for medium format photography - matched to the performance characteristics of this instrument. Photo-visual flat-field Telecompressor f/4.7 for use with 1.25 or 2 inch eyepieces - enjoy fields of view of up to 4 degrees with a suitable eyepiece! TeleVue "Starbeam" Sight: Beautifully machined and black anodized aluminum, on a quick release machined hardware. Battery powered illuminator is adjustable in brightness; it projects a 10 arc minute diameter red dot onto a transparent 40mm clear aperture window so that the dot appears to be over wherever the scope is pointed. Six arc minute accuracy make "star hopping" easy. Telescopes such as this often put the eyepiece at position that is only about 3 or 4 feet (0.9 or 1.2 meters) from the ground. Since most of our customers are taller than that, they will find it uncomfortable to stand bent over to observe for extended periods. For a much more enjoyable and comfortable observing experience, Company Seven recommends the Observing Chair; this is our most comfortable, flat folding, adjustable height seat. It is not inexpensive, but is so practical and can be used for camping or other times when a comfortable portable seat is desired. Company Seven's ATA Transport/Shipping Case: the case provided by Astro-Physics with each optical tube assembly is a reasonable balance of economy and performance for routine storage of a telescope in a temperature and humidity controlled environment. 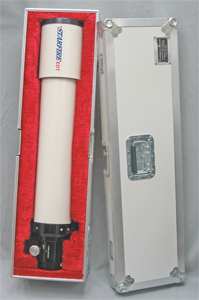 However, if you plan for long term storage, or if you intend to ship the telescope by commercial carrier or transport it as check in baggage on an airliner (observing oversize and overweight restrictions) then your peace of mind and telescope will both be better served with a custom engineered solution - an ATA case by Company Seven. Left: Astro-Physics Model 900 Mount in optional Company Seven ATA case. and Counterweight Shaft (94,326 bytes).